A lot slower paced, food here is really good. 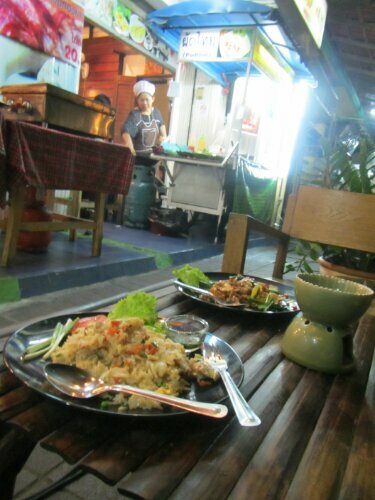 They are known for their vegetarian dishes. The red eye train ride from Bangkok to Chiagn Mai was rough. I slept on a top bunk and it was super rocky. I didn’t sleep a wink. Note to self get a bottom bunk next time! In the morning I went on the bottom bunk to take in the beautiful view of jungle. We stayed at Baan Jaja the first night because the Awanna House wasn’t available until the next night. I really like both places. Awanna is cool because it has a pool and a roof top deck you can hang out on. We rode scooters to Mae Rim, which is north of Chiang Mai. After being lost for about 30 minutes and going back and forward on the rode 3 times, we finally came to our destination, Tiger Kingdom. It was about 5 pm, which is when they were super active and playful. If you want to be able to lay on the tiger you should go earlier in the day when they are sleepy. 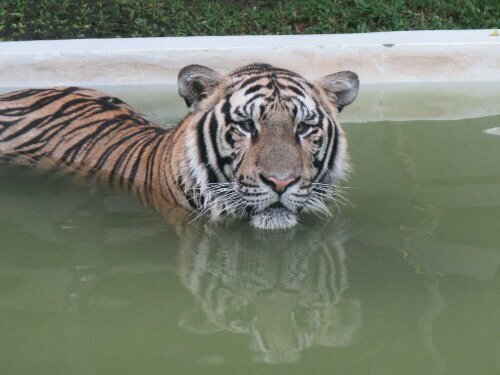 There were about 7 – 3 month old tigers in one cage. They were just beating each other up! Their paws were so big it reminded me how big they will get. Levi and I were allowed in the cage to pet them. 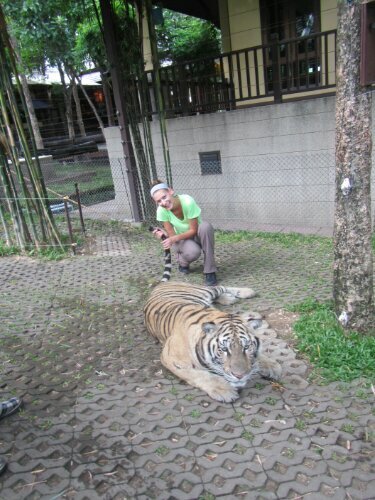 The scariest part was going into a cage of 6 large tigers! Very intimidating. There were 4 handlers that would keep them in check by hitting them with a stick and making a Ceaser Milan “sstt! !” How that works, I have no idea! Its gotta be the training!! A big one stared at me and I slowly stepped behind the handler. I swear it want to leap and play with me or maybe eat me because their feeding time was right after we got out of the cage. My favorite tiger was cross eyed. You never knew who or what he was looking at. After this experience, I realize this would never happen in the US. Too many lawsuits waiting to happen. 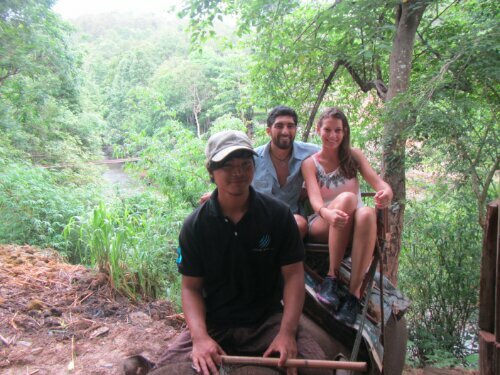 I rode a baby elephant in a river. Did I forget to mention I bathed him in the river and got to jump and stand on him? To top it off it was raining which made it so much cooler. We got a lot of time with the elephant because all the other tourist didn’t want to get wet. They missed out majorly! I think they had fun watching us try to balance on the elephant and of course falling into the water. I felt his tongue when I fed him bananas. So gross, but so cool at the same time. We also rode a big one and we got to fed her. 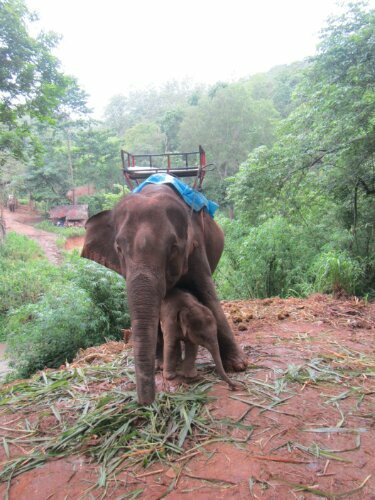 There was a little baby elephant that the mother was very protective of. This little guy tried ramming me into a tree, he’s pretty strong. 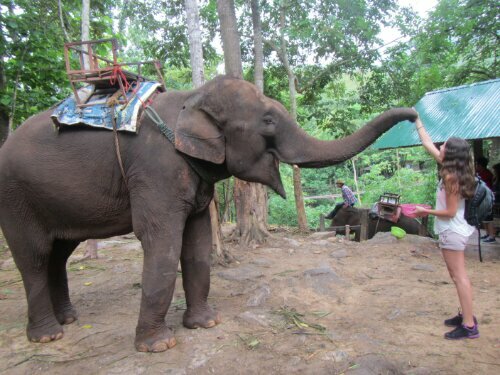 Go with Noi Nid Happy Toure Service, their half day elephant trek. It was an awesome experience! you can arrange to be picked up with Am Cool Travel. Lek will help you out. She speaks good English and is really helpful. Next stop is Pai(4 hours north of Chiagn Mai). It is time to take my malaria pill because I will be in Laos, which has a low-risk malaria zone, in 2 days. 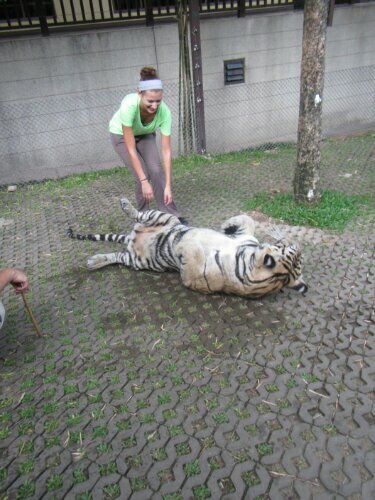 I just love seeing my little sister petting TIGERS!!! Woah! Amazing! Keep the details coming!! Love you! I love them too!! The baby was way too cute.